There’s no question that in the past two decades, the breadth and depth of French composer Florent Schmitt’s music that has made it to the microphones has increased dramatically. Nearly every year, we are treated to world premiere recordings of more Schmitt works. The most recent examples are the complete works for piano duo and duet as recorded by the Invencia Piano Duo … the children’s ballet Le petit elfe Ferme-l’oeil with Jacques Mercier and the Lorraine National Orchestra … and the Introït, récit et congé for cello and orchestra featuring soloist Henri Demarquette. 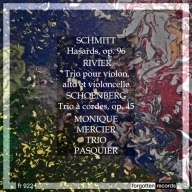 But back in the LP era, there were also a number of fine recordings made of Schmitt’s music — although many of them had only limited distribution beyond the borders of Schmitt’s native land. In too many cases the recordings didn’t stay in the catalogue for long, either. Back in the 1970s and 1980s when I was seeking out recorded repertoire beyond Schmitt’s most famous work, La Tragédie de Salomé, I found it nearly impossible to acquire these recordings. But then I was fortunate to become acquainted with a fellow classical music lover who lived in France, and we traded records: He passed along out-of-print French recordings of Schmitt’s music while I sent him RCA Camden LPs featuring symphonic recordings with America’s major orchestras that had been released originally on Victor 78-rpm sets in the 1940s. I still own those early Schmitt LPs, since most of the material never resurfaced on CD. … Until recently, that is. And for that, we have a gentleman named Alain Deguernel and his family-operated boutique enterprise called Forgotten Records to thank. 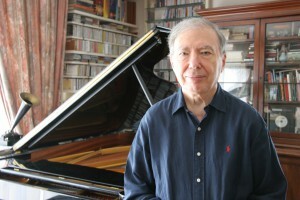 Alain Deguernel, founder and head of the Forgotten Records CD label. Over the span of a decade, Mr. Deguernel has taken hard-to-find recorded material featuring mainly French performers and French repertoire, and lovingly transferred these performances from mint-condition LPs to CDs. In this endeavor, he is assisted by his son, an IT engineer, and his wife. Everything is “made to order” and shipped in the form of physical CDs (downloads are not offered). Having purchased more than a dozen CDs from Forgotten Records, I can personally attest to the precision and care that have gone into these releases – from the quality of the audio transfers to the design of the CD artwork and the inclusion of relevant online links to further information about the featured composers and performers. Impressively, the Forgotten Records catalogue now numbers nearly 1,000 CDs, generously filled (many containing more than 70 minutes of music) and priced affordably. Most of the earlier CDs released by Forgotten Records were of commercial recordings from the 1950s and 1960s. More recently, Mr. Deguernel has also been transferring rare compositions and performances from radio broadcasts – some of them the world premieres of contemporary French compositions. Hasards, Op. 96 (1939), performed by pianist Monique Mercier and the Pasquier Trio — the same ensemble that premiered the work in 1943 (radio broadcast performance from May 30, 1959). Forgotten Records FR 922, coupled with works by Jean Rivier and Arnold Schönberg. Quartet for Strings, Op. 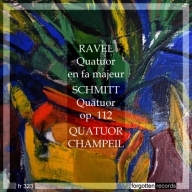 112, (1947), performed by the Champeil Quartet (recorded by EMI/Pathé-Marconi on December 7, 1956 at Maison de la Mutualité, Paris). Forgotten Records FR 323, coupled with Maurice Ravel’s String Quartet. Une Semaine du petit elfe Ferme-l’oeil, Op. 58 (1912) and Trois rapsodies, Op. 53 (1903-4), performed by duo-pianists Robert & Gaby Casadesus (recorded in Paris by Columbia Records in June 1956). 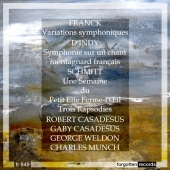 Forgotten Records FR 849, coupled with works by César Franck and Vincent d’Indy. Sonate libre en deux parties enchaînées, Op. 68 (1919), performed by violinist Jean Fournier and pianist Ginette Doyen (recorded by Véga in 1959). 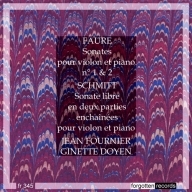 Forgotten Records FR 345, coupled with the two Violin Sonatas of Gabriel Fauré. La Tragédie de Salomé, Op. 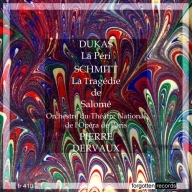 50 (1907/12), performed by Pierre Dervaux and the Orchestre du Théatre National de l’Opéra de Paris (recorded by EMI in the presence of the composer on October 16, 1957 at Maison de la Mutualité, Paris). Forgotten Records FR 410, coupled with La Péri by Paul Dukas. La Tragédie de Salomé, Op. 50 (1907/12), performed by Pierre Dervaux and the Orchestre National de la Radiodiffusion-Télévision Française (radio broadcast performance from May 20, 1958). Forgotten Records FR 918, coupled with works by Emmanuel Chabrier, Claude-Achille Debussy, Édouard Lalo and Maurice Ravel. La Tragédie de Salomé, Op. 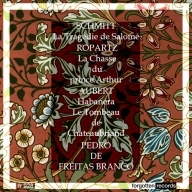 50 (1907/12), performed by Pedro de Freitas Branco and the Orchestre National de la Radiodiffusion-Télévision Française (radio broadcast performance from February 21, 1955). Forgotten Records FR 928, coupled with works by Louis Aubert and Guy Ropartz. Trois Dances, Op. 86 (1935), performed by pianist Françoise Gobet (recorded by Véga in 1958). 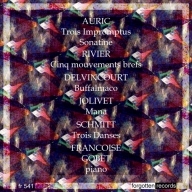 Forgotten Records FR 541, coupled with works by Georges Auric, Claude Delvincourt, André Jolivet and Jean Rivier. That may well be true … but we owe a debt of gratitude to Mr. Deguernel for his efforts on behalf of the music of Florent Schmitt and many other composers and performances — recordings that wouldn’t be available today were it not for the work he is doing with Forgotten Records. In the future, I am hopeful that he will be successful in unearthing more “forgotten” Schmitt treasures – such as several French Radio broadcast performances of Schmitt’s monumental Psaume XLVII: Fine renditions exist featuring conductors Igor Markevitch (1953) and Désiré Inghelbrecht (1958), ably supported by famed soprano soloists Elisabeth Schwarzkopf and Régine Crespin. Orders can be placed directly from the website, and the company ships worldwide. 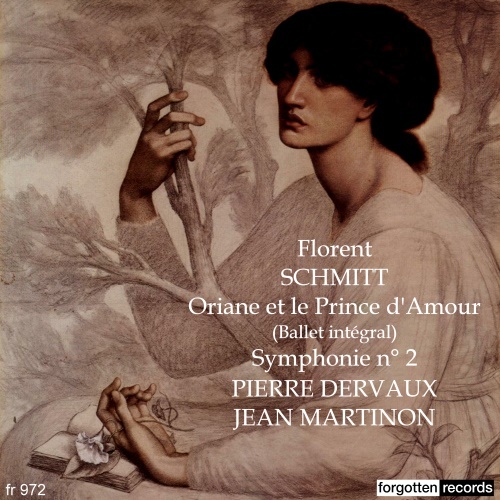 Update (6/26/14): Forgotten Records has now released its ninth CD containing music of Florent Schmitt. In this case, the entire CD (Forgotten Records FR 972) is devoted to two important works. The main selection is the complete ballet music to Oriane et le Prince d’Amour, Op. 83, composed in 1932-33 and first produced at the Paris Opéra in 1938. The complete score of this piece has never been commercially recorded; this particular performance emanates from a 1956 French National Radio broadcast featuring Pierre Dervaux conducting the the Orchestre National de l’O.R.T.F. and the O.R.T.F. Chorus, along with tenor soloist Pierre Peyron. Also on this generously timed CD is Florent Schmitt’s penultimate work, the Symphony No. 2, Op. 137, written in 1957 near the end of the composer’s life. That performance is a live broadcast dating from 1960, masterfully interpreted by Jean Martinon who conducts the Orchestre Philharmonique de l’O.R.T.F. We owe a particular debt of gratitude to Forgotten Records for releasing the complete Oriane ballet — the first time that music lovers have ever had the opportunity to obtain this music on recordings. Update (11/16/15): A tenth CD from Forgotten Records that contains music of Florent Schmitt has just been released. It is a disk (Forgotten Records FR 1136) featuring pieces for wind ensemble recorded by the French record label Ducretet-Thomson in 1954 and 1956. Two of Schmitt’s most famous wind works headline the recording: Dionysiaques, Op. 62 and “Le Camp de Pompée,” a fanfare for brass and percussion extracted from the first suite from Antoine et Cléopâtre, Op. 69, originally composed as incidental music to André Gide’s adaptation of Shakespeare’s play. The performances are by Musique des Equipages de la Flotte de Toulon, conducted by Jean Maillot. Also on the CD are works for wind ensemble by Paul Hindemith and Darius Milhaud. Update (1/14/17): Yet another CD from Forgotten Records that features the music of Florent Schmitt has now been released. 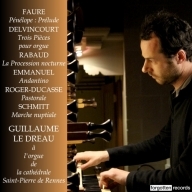 It is a disk (Forgotten Records FR 37LD) of newly recorded selections (2016) that features French organ music performed by Guillaume Le Dréau, principal organist at Rennes Cathedral. Schmitt’s Marche nuptiale, Op. 108 is included, along with organ works by Claude Delvincourt, Jean Roger-Ducasse and Maurice Emmanuel. In addition, Le Dréau’s own organ transcriptions of orchestral works by Gabriel Fauré (Pénélope) and Henri Rabaud (La Procession nocturne) are included. Update (7/13/17): The latest release featuring the music of Florent Schmitt now makes an even dozen recordings in the Forgotten Records catalogue. It is a disk (Forgotten Records FR 1346) that showcases the artistry of the conductor Albert Wolff in recordings he made in 1931 and 1932 with the Orchestre Lamoureux. The three musical selections, painstakingly digitized from the 78-rpm record collection of Claude Fihman, include Vincent d’Indy’s Symphonie cevanole (with pianist Jean-Marie Darré), Roussel’s Symphony No. 3, and Florent Schmitt’s Rapsodie viennoise, Op. 53, No. 3. Whereas numerous recordings of the 1904 Rapsodie viennoise exist in Schmitt’s original version for two pianos, the 1931 Wolff recording remains the only commercial release of this music in its orchestral garb — an arrangement prepared by the composer in 1911. 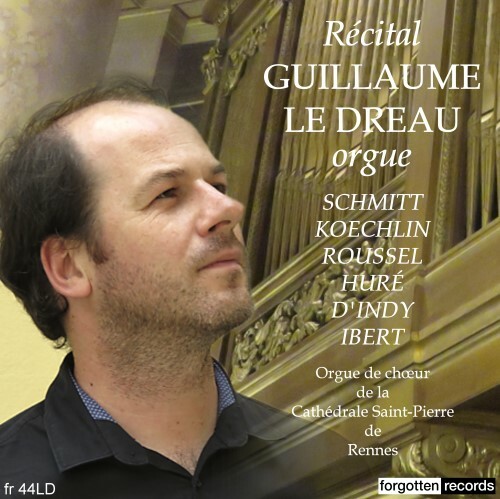 Update (9/9/18): Guillaume Le Dréau‘s newest organ recital recording has now been released in Forgotten Records’ 13th recording containing works by Florent Schmitt. The recital was recorded at Rennes Cathedral in February, April and May 2018. It contains the recording premiere of the newly rediscovered Opus 11 Prélude by Schmitt. The fascinating back-story of this composition’s rediscovery is recounted in this article on the Florent Schmitt Website. In addition to the premiere recording of the Opus 11 Prélude by Schmitt, the recital includes music by Jean Huré, Albert Roussel, Charles Koechlin, Jacques Ibert and Vincent d’Indy — many of them rarities as well. The new recording (Forgotten Records FR44LD) is available for purchase from the Forgotten Records website. 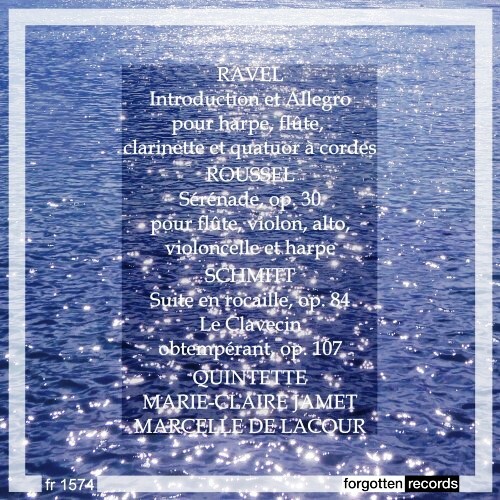 Update (12/19/18): The newest release that includes music of Florent Schmitt — #14 and counting — (Forgotten Records FR 1574) contains an important addition to the composer’s discography: Marcelle de Lacour’s 1957 RTF broadcast performance of Clavecin obtempérant, Op. 107 (“The Ill-Tempered Clavier”). This fascinating 1945 composition, which has never been recorded commercially, was dedicated to Mme. de Lacour who gives a robust and winsome performance here. 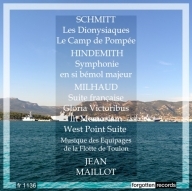 Also featured on this CD is Schmitt’s Suite en rocaille (1935), in a 1960 commercial recording by the Marie-Claire Jamet Quintet. The performance appeared origonally on an Erato LP along with chamber music by Maurice Ravel and Albert Roussel. This entry was posted in Ballet, Chamber Music, Classical Music, Composers, French Composers, Organ Music, Piano Four-Hand Music, Piano Music, Uncategorized and tagged Alain Deguernel, Albert Wolff, Classical Music, Florent Schmitt, Forgotten Records, French Composers, Hasards, Jean-Marie Darre, Orchestre Lamoureux, Petit Elfe Ferme l'Oeil, Salome, Schmitt, Sonate libre, String Quartet, Tragedie de Salome, Trois danses, Trois Rapsodies. Bookmark the permalink. Thank you for sharing this news, Bryan. I have just listened to the Shellackophile upload and it is very fine, indeed. This recording is a very “elusive” 78-rpm set of highly interesting and inventive music — and it’s one of Schmitt’s least-known compositions. Thank you for making it available online at long last.